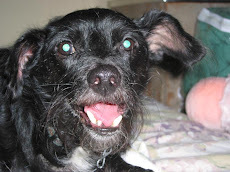 My dog says today we're talking toppers! Although this topper can also be a rehydrated food, a mixer, or even a treat! What is it, you ask. 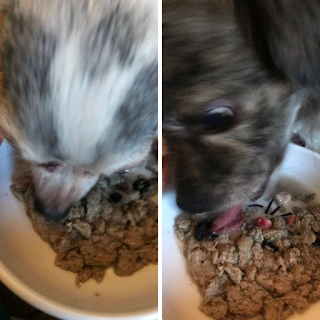 It's Stella & Chewy's Lil' Superblends Meal Mixer! For this review we tried the 95% cage-free chicken recipe (with organs and bone) and 100% organic fruit and vegetable superfoods that is packed with nutrients, probiotics, and antioxidants. Not only do probiotics help with healthy digestion and prove gentle on sensitive tummies, but a raw diet can help improve appetite, teeth and gum health, skin and coat condition, and also relieve allergies. As always, we like to take a careful look at the ingredient list on all the foods we serve. 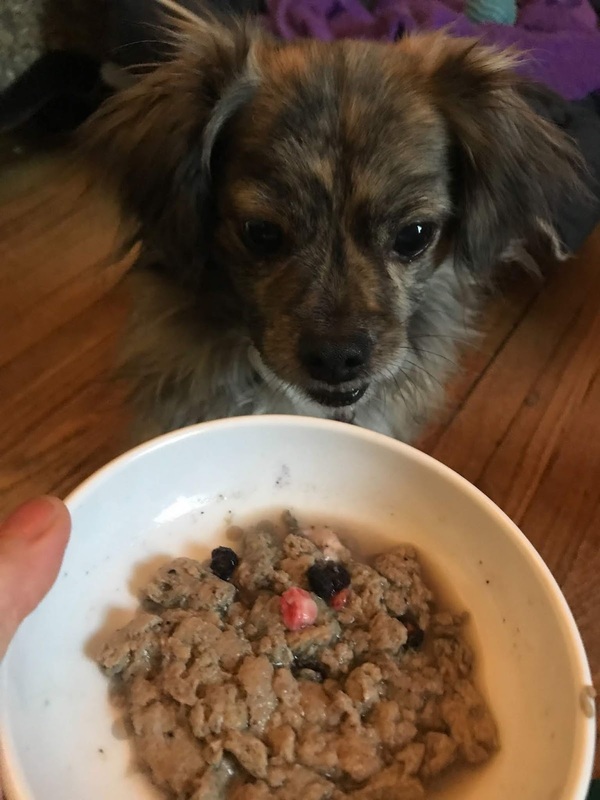 This variety of meal mixer includes chicken with ground bone, chicken liver, chicken gizzard, organic bananas, and organic wild blueberries as its first five ingredients. It also has strawberries, cranberries, spinach, broccoli, beets, carrots squash, and apples (all organic!) and also pumpkin seed. Weeeellll, making it soft was the a huge hit! Everyone wanted to sample the goods and scarf it up! We ordered the Stella & Chewy's Lil' Superblends Meal Mixer from Chewy.com and it's available in two sizes. (Remember, the weight for freeze-dried foods is always less that what you'd expect but generally turn out to be more food than you'd anticipate! We started with the smaller size, but since it's such a huge hit we'll be ordering the larger size next time---and there will be a next time!) We're excited to say that this food was a big-time winner in our home and we give it an enthusiastic four out of four paws up! Wooooof!